With JungleDocs, you can generate a batch of documents with the click of a button. In this tutorial, you will learn how to do this. 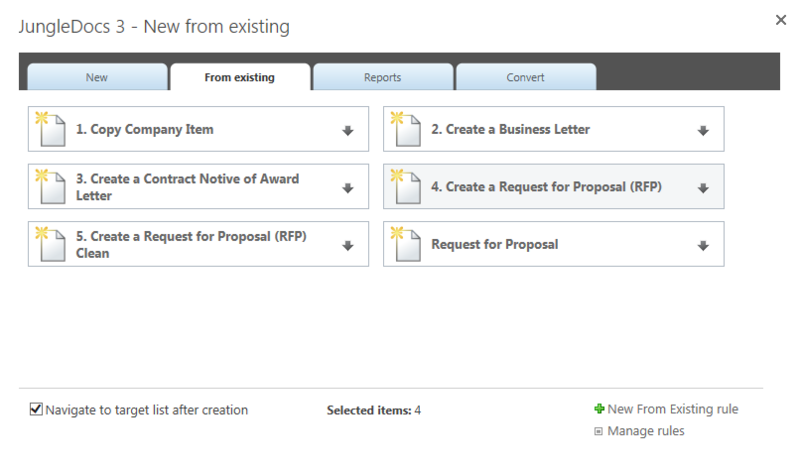 Very often companies need to create requests for proposal (RFPs), invitations, or other documents for several companies at once. In the guideline for document naming automation, we already explained how to set up a JungleDocs rule to create business letters from selected company items. Basically, if you select several companies and run the rule on the From Existing tab, multiple unique documents are created for selected companies. The tutorial below shows how you can use the same functionality to create multiple RPF's at once. 1. Navigate to the Companies list and select the vendors you would like to send the RFP's to. Note: SharePoint doesn't allow you to select more than 100 items at once. 2. Run JungleDocs from the ribbon and create a new rule using the From existing tab. To learn more about creating different rule types in JungleDocs, click here. Set the target column values and other settings. As you can see in the below image, you have all of your RPF's created and saved in the correct library.